Investing in the future is a huge focus to Shakespeare Engineering, and the best way that we can achieve this is by investing in youth apprentice schemes, developing individuals within the industry of engineering. As a company we currently have 15 apprentices, working at multiple levels and skills within the business. Apprenticeships are the ideal way to combine practical training whilst working within a company, as well as providing study that will also run alongside. 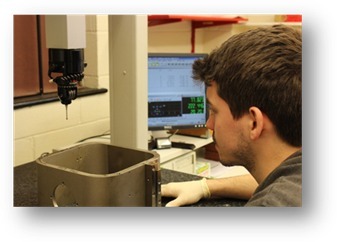 Within Shakespeare Engineering, our apprentices will generally study with a day release programme over a period of 3-5 years, with successful college students attaining nationally recognised qualifications such as NVQs and BTECs and our successful in-house students attaining accreditations of proficiency within their specific sectors of the business. Mitch joined Shakespeare Engineering in 2011 with the mind set of developing himself within the world of engineering. After proving his competency as a machine operator, Mitch started his in-house apprenticeship, learning within the business. The primary role that he has undertaken is within inspection, and this is where Mitch has really shown his proficiency working with equipment such as CMM, Vertex and shadowgraph, becoming an invaluable member of the Shakespeare team. Mitch’s career within Shakespeare Engineering is going from strength to strength, with the final goal of being accredited by the company for his skills within engineering.